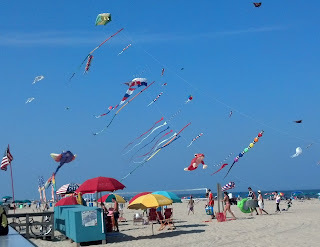 Ocean City Maryland, Woo Hoo!! Hotel on the beach on 33rd Street, close enough to the boardwalk and the fun that goes with it but far enough away not to be bothered. I spent last week with my brother, Mom, and beautiful niece Jackie and her two daughters. Of course the temperatures were painfully hot last week and the Eastern Shore of Maryland was not spared. As a matter of fact the evening before I arrived there was a terrible storm that uprooted trees, downed power lines for thousands of customers in the DC and Baltimore area. By the time the storm crossed the Chesapeake Bay it had lost some of its punch and was only troublesome. We ate hard crabs for breakfast and lunch the first two days I was there, yum. There is something special about crabs caught in the Chesapeake Bay or one of its tributaries. The flavor is just different, then steamed in Old Bay Seasoning. Our room was right on the beach thanks to my brothers amazing generosity. Mom got to the beach twice, which is very difficult for her and would be impossible on her own so she sat on the balcony and watched us happy to be included in all the excitement. We rented bikes one morning. You are permitted on the Boardwalk until 10AM each day. The bike vendors have got a sweet deal only working until 10AM, as long as you aren’t the one fixing the bikes I suppose. Anyway, Jackie decided we should take Gram on the ride with us. 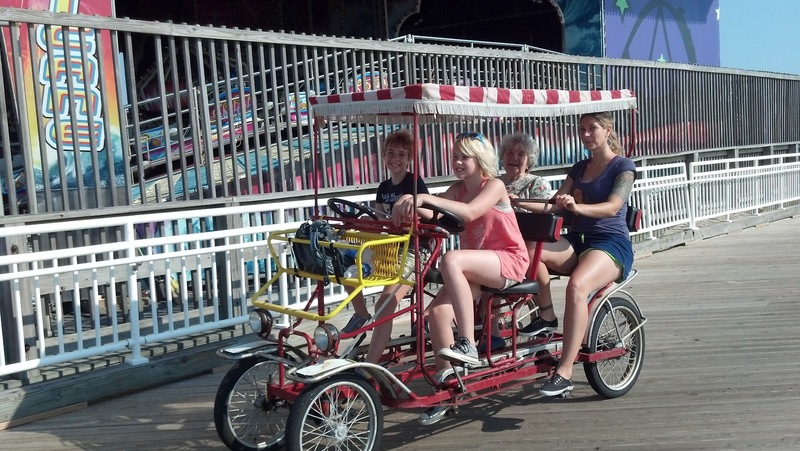 There is no way Mom could even get on a bicycle built for two so I was curious of her plan. 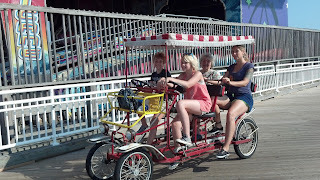 We ended up on a bicycle built for four. To Mom’s delight she got on the bike and off we went. All I can say, it is a good thing there were no hills to climb we would not have been successful. The bicycle built for four was a chore but worth every bit of effort. Another must do, if you are a family of seafood lovers, is a visit to Phillips Crab House. They have many things besides crabs, any choice is a taste treat. We have been going for years and found it a great place to hide from the mid-day sun before going back to the beach. 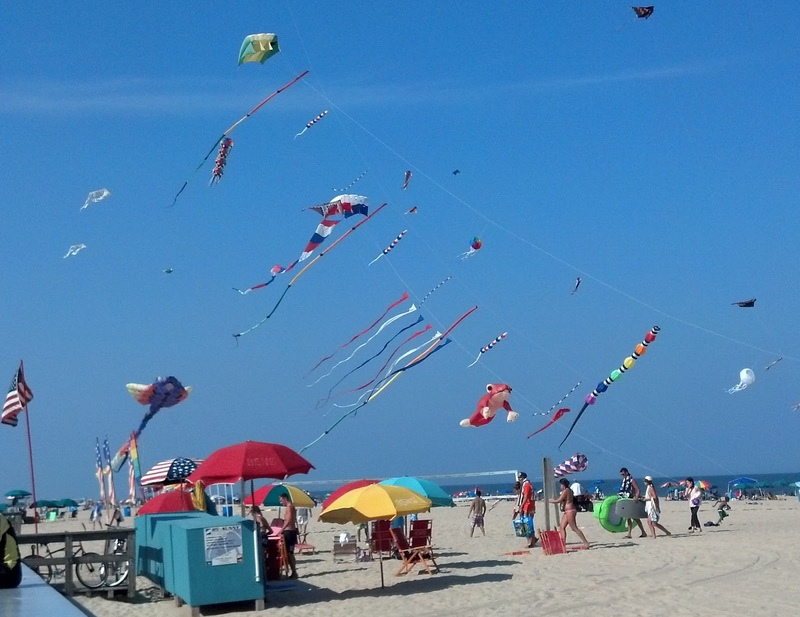 We all went to the boardwalk of course, to purchase all the summertime delights like salt water taffy, Thrasher’s French fries, Wockenfuss dark chocolate truffles, a visit to the Kite Loft is a must, and of course beach trinkets galore, were almost free. We even got to a Shore Birds baseball game which was quite exciting, I particularly love the 7th inning stretch with all the singing, we did the chicken dance, the home team won, then the stadium offered a July 3rd fireworks display that was quite good. So far it has been the fastest week of my summer.